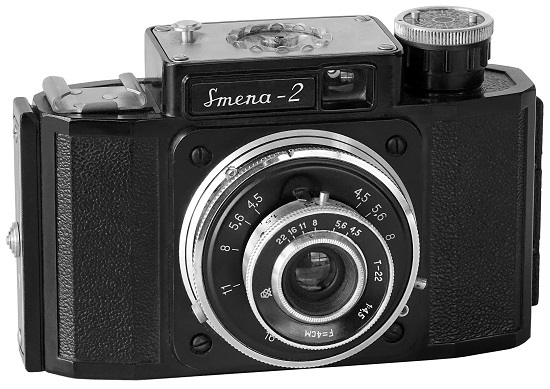 Bakelite camera identical to the Smena-1, but with synchronized flash. 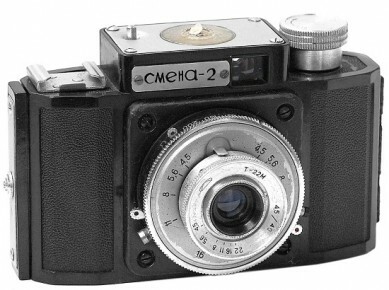 Shutter ZT-8 with delay mechanism. 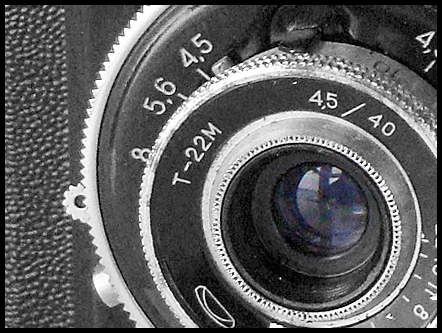 Shutter: 1/10, 1/25, 1/50, 1/100, 1/200 + B. Original price (in year 1961) 13 roubles. PK2005. 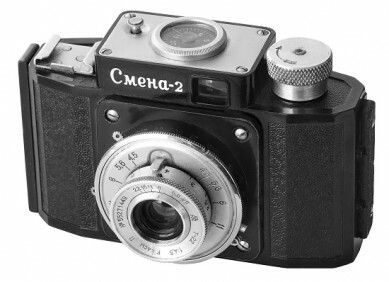 This very early version released in 1955 with synchro and selftimer added. 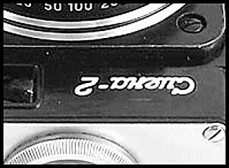 Lens T-22 and shutter faceplate white as well as film advance knob (no memo). 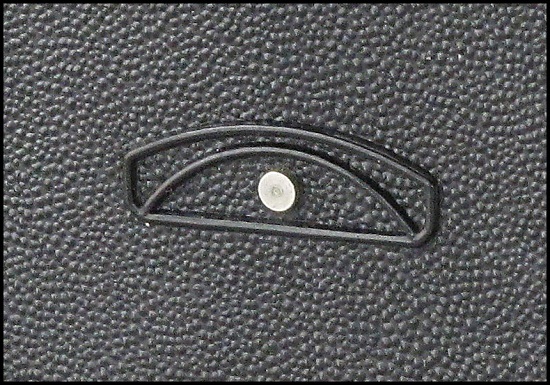 Serial number with date prefix engraved on lens. 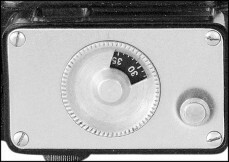 Aluminum frame counter with black disk inside. Very rare to find nowadays. PK2010. 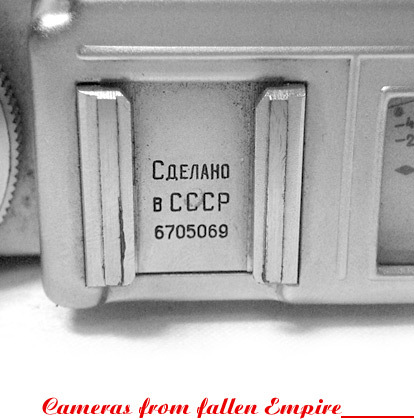 Camera identical to PK2005, but without date prefix in serial number already. 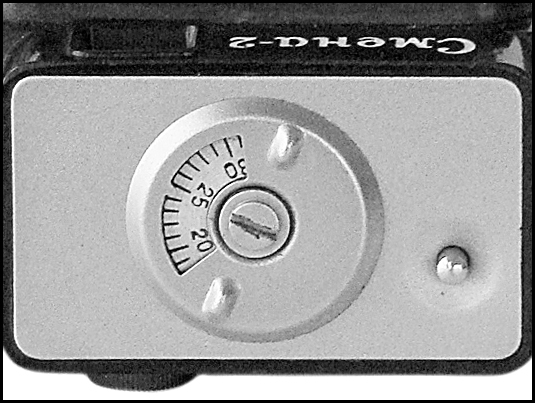 Lens T-22 and shutter faceplate white as well as new design film advance knob (no memo). 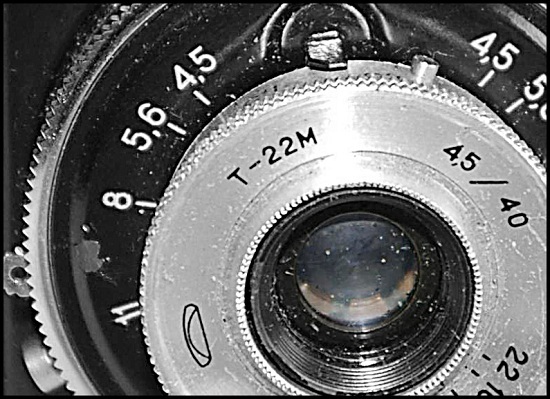 Markings on the lens are red colour. Serial number engraved on lens frontplate. Aluminum frame counter with yellow round glass (see picture below). PK2015. Very uncommon version of Smena-2 was found in private collections. 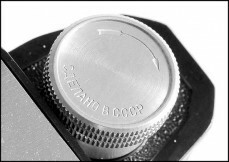 Camera identical to PK2010, but with additional "SDELANO B CCCP" engravings on the film advance knob (see picture below). Camera from Istvan Csabai (Hungary) collection. PK2020. 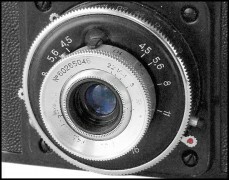 Camera identical to PK2010 with few exceptions: all markings on the lens are written in black colour, aluminum black frame counter with transparent round glass (see picture below). 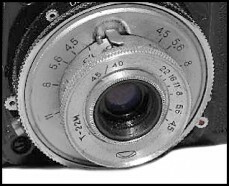 Serial number engraved on lens frontplate. PK2040. 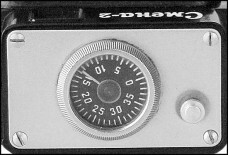 An advanced GOMZ Smena-1 camera, with synchro and selftimer added. Combined shutter release button and frame counter (since 1959). 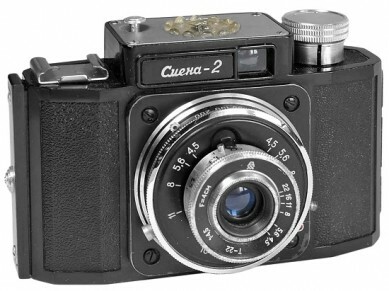 Lens T-22 and shutter faceplate black as well as plastic film advance knob with memo already. Plastic frame counter. 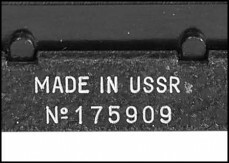 6 digit serial number engraved in white on closing bar of the case see picture below). Single platform for name markings. 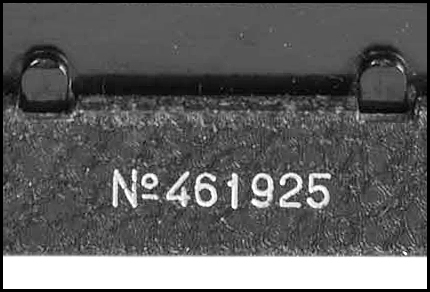 PK2045. 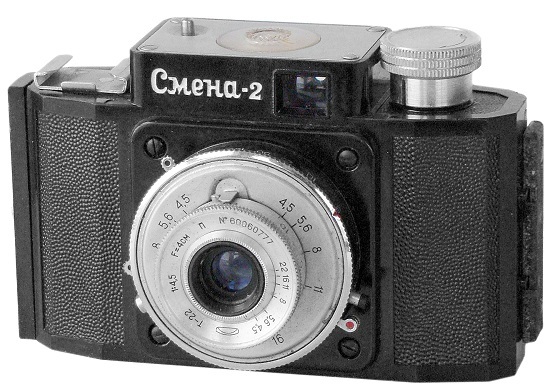 camera identical to PK2040, but with slightly different body mouldings. There is no platform for name markings (see picture below), though the big majority of 2nd version cameras come with single platform indeed. Aluminum or plastic frame counter. PK2055. Camera identical to PK2040, but with different top plate mouldings (nameplate can be detachable now). 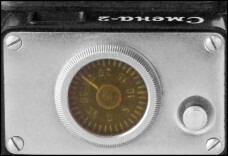 The white film advance knob (no memo) again. 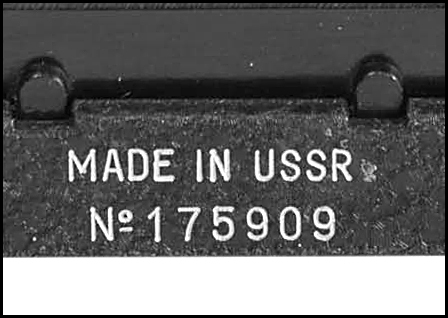 6 digit serial number engraved in white on closing bar of the case. No otherwise different. Camera #461925 from Istvan Csabai (Hungary) collection. PK2057. 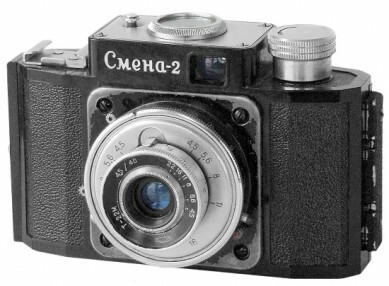 Very interesting version of the particular camera. 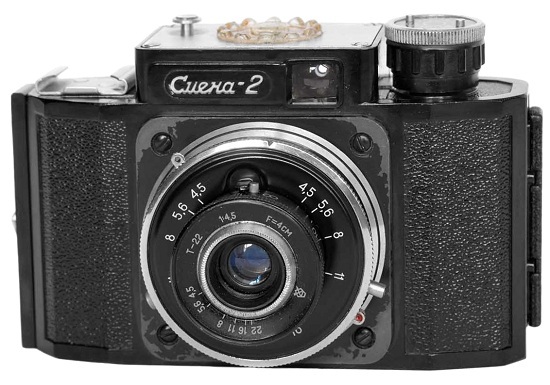 Identical to PK2040, but with totally black T-22 lens (only the aperture setting ring is white) and single "CCCP" engravings on closing bar of the case (see picture below). 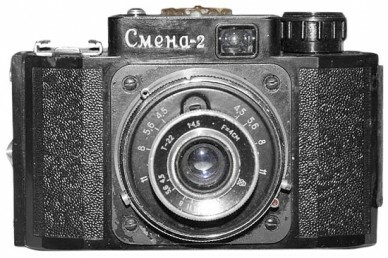 Camera #708146 from Istvan Csabai (Hungary) collection. PK2065. "NO-NAME" version again (very rare). Camera identical to PK2060, but with totally redesigned top plate already (see picture below). 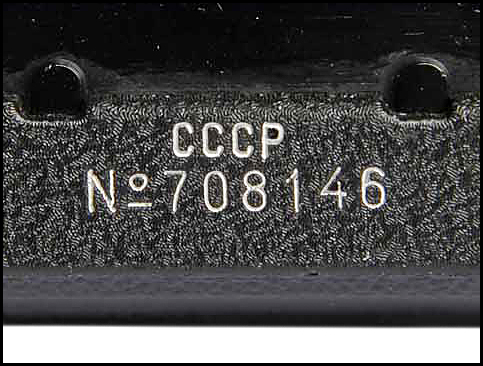 6 digit serial number engraved on closing bar of the case. No otherwise different. PB0105. Camera identical to 1st version cameras, but released in new Belarus factory MMZ (c.1957). The camera has MMZ logo on lens and the rear door (see picture below). Comes with aluminium frame counter. Date prefix in serial numbers. 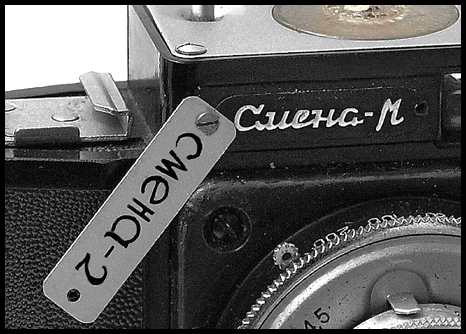 Few slightly different nameplate variations are known to exist. PB0110. MMZ experimented on new frame counter design to avoid its frequent breakdowns. Opposite you can see a camera with newly redesigned metal top plate. No otherwise different. PB0115. Camera identical to PB0105, but with plastic frame counter already. The same counter shapes later were used in Smena-M and Smena-2M cameras. No otherwise different. 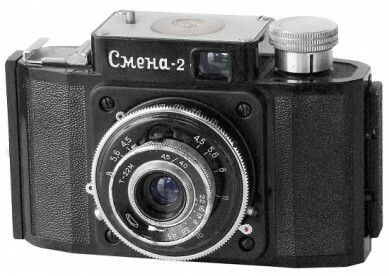 PB0120. 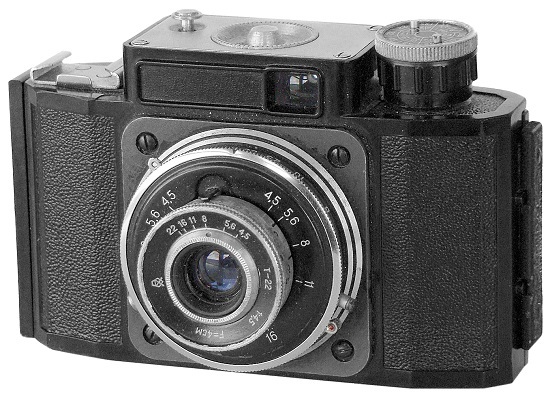 Camera identical to PB0105, but with black shutter faceplate. 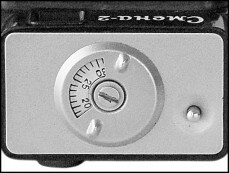 Aluminium frame counter. Investigated camera has s/n #60104612 (J.Halmeenmaki coll.). PB0125. 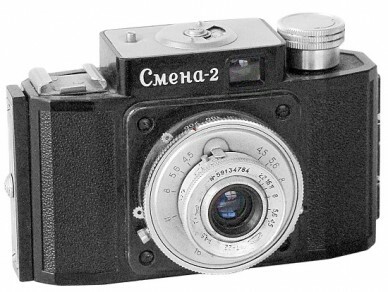 Less common to find version of the particular camera. 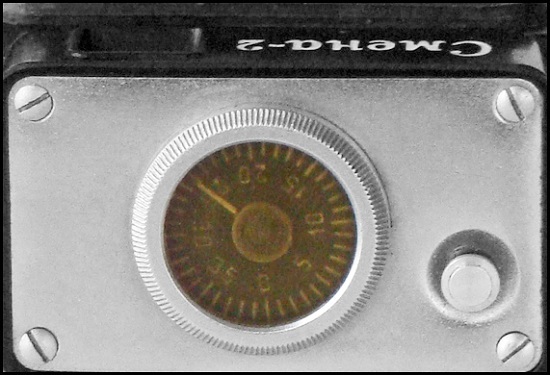 The film rewind knob was replaced to white one, which doesn't fit camera design absolutely. No toherwise different. PB0130. Camera identical to PB0115, but with black shutter faceplate. Released in 1960 by MMZ. Plastic frame counter. Investigated camera has s/n #60265046 (SovietCams). PB0205. Camera identical to 3rd version cameras, but with new "T-22M" lens. Released in MMZ since 1960. Lens and shutter faceplate are black, though film rewind knob is white as usual for MMZ Smenas. 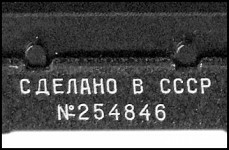 Serial number with date prefix engraved on the closing bar of the body. PB0210. 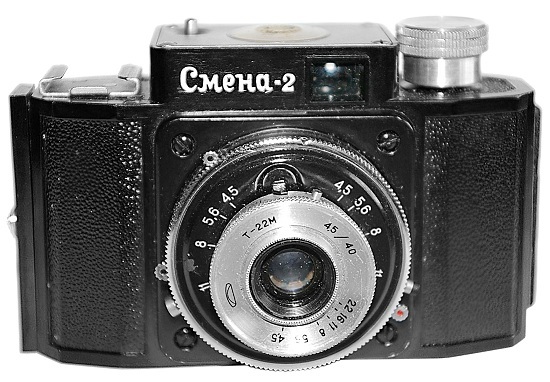 Camera identical to PB0205, but with white shutter faceplate. Lens T-22M still black. Aluminum frame counter again. No otherwise different. PB0215. 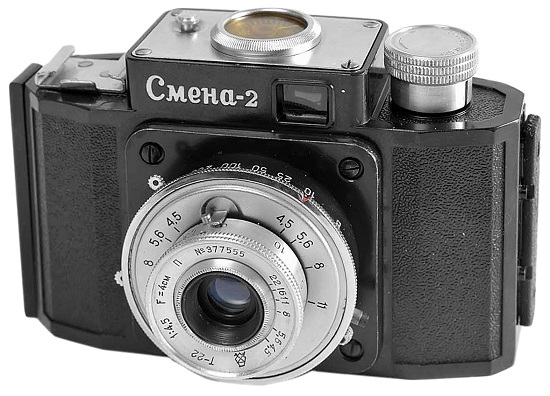 Camera identical to PB0210, but with totally white T-22M lens already. Aluminum frame counter. 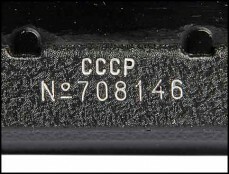 7 digit serial number (instead of 8 digits). Investigated camera has s/n #6148866 (J.Halmeenmaki coll.). 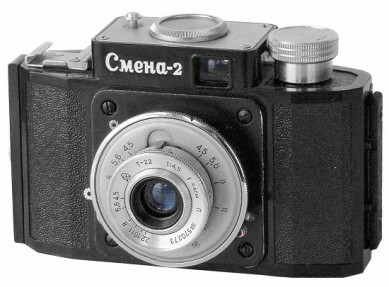 PB0210 - Smena-2 (without s/n). 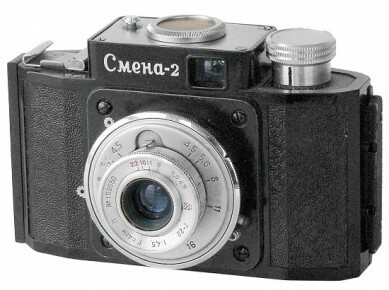 PB0220. 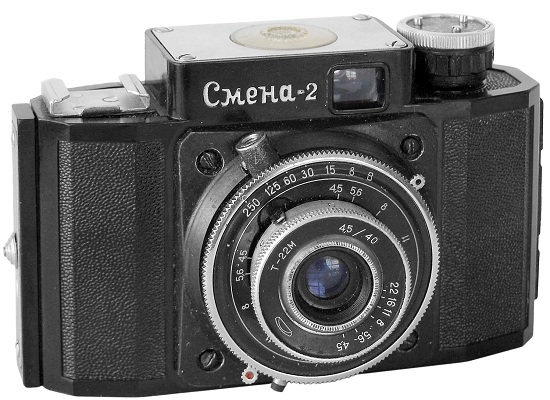 Camera identical to PB0215, but with black shutter faceplate again. Plastic frame counter. No otherwise different. Camera from Vigantas Šlepavičius (Lithuania) collection. PB0515. 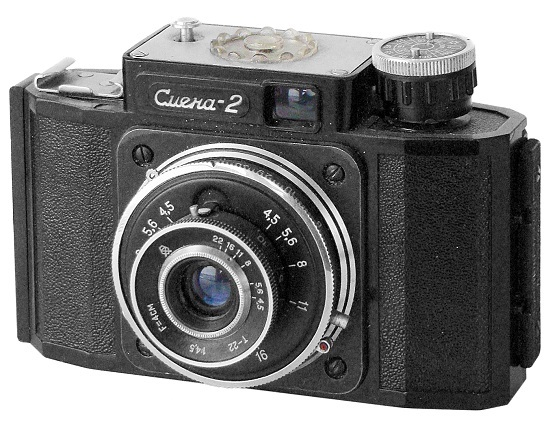 Very interesting version of the particular camera again. 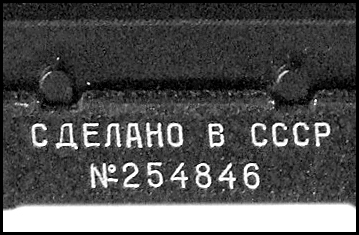 White metal plaque with Smena-2 markings on the frontplate. 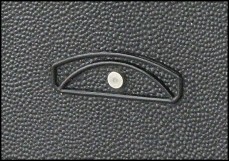 Plastic frame counter, white T-22M lens. Very uncommon to find camera. Camera from Viktor Suglob (Belarus) collection. PB0420. 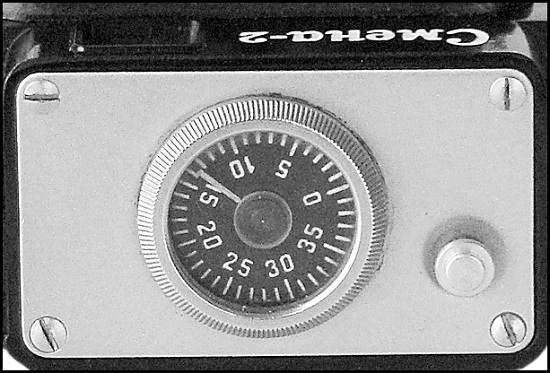 New construction of shutter with different shutter speeds: 1/8, 1/15, 1/30, 1/60, 1/125, 1/250 + B. 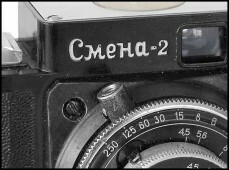 Under name „Смена-2“ in Cyrillic characters. 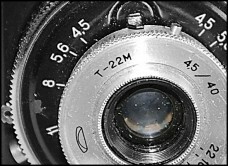 Both T-22M lens and shutter faceplate are black. Plastic frame counter. O.k. it‘s a variant of uncommon Smena-2M. More detailed information on chapter "Smena-2M cameras".